NEW YORK - Sitting in a stark interview room deep inside Yankee Stadium, Red Sox slugger David Ortiz yesterday insisted he had not used steroids and he began what amounted to an attempt to rebuild his reputation. Ortiz, 10 days after he acknowledged his name was on a list of players who tested positive for performance-enhancing drugs in 2003, said he had used over-the-counter supplements in his past, but insisted he had never taken steroids. Ortiz’s remarks amounted to first extended response to a July 30 New York Times report that he was on the list of 104 players who had tested positive for performance-enhancing drugs after a 2003 survey test. The Times did not specify what drugs were detected in the test. Yesterday’s press conference, held before the Sox lost a third consecutive game to the Yankees, was unfamiliar ground for him. He started his remarks with a short laugh and an excuse for his Dominican accent, but was serious throughout the half-hour appearance. Red Sox manager Terry Francona leaned against a wall nearby and Ortiz’s father sat in the front row facing his son. Seated next to Ortiz was Michael Weiner, general counsel for the MLB Players Association, who criticized the leaks from the list. Weiner said that just because a player’s name is on the list does not mean they tested positive because “substantial scientific questions’’ remained about the 2003 survey testing. It marked the first time a union official had publicly sat beside one of the accused in the scandal that has tarnished several top players, including Manny Ramirez, Alex Rodriguez, and Sammy Sosa. “I want to apologize to the fans for the distraction, my teammates, our manager. We’re going through a situation right now. This past week has been a nightmare to me because I’m the kind of guy that I look forward to - I think about the fans every day. After the revelation that his name is on the list, Ortiz hit a three-run, game-winning home run to a thunderous ovation at Fenway Park on July 30. Then, the Red Sox lost both games of a two-game series against the Rays in St. Petersburg, Fla., and lost the first three games in a four-game series against the Yankees at Yankee Stadium. Those losses dropped the team 5 1/2 games out of first place in the American League East. Ortiz has personally endured a stretch of one hit in 25 at-bats. While Ortiz had said initially that he was “blindsided’’ by the allegations that his name was on the list, he acknowledged yesterday that he had met with a union representative in 2004 in a session that lasted approximately five minutes, but said he was not told at the time that he had tested positive for steroids. Weiner said that Ortiz, like every other player on the list, was told in August or September of 2004 that they were on a list attached to a grand jury subpoena issued by the government. Beyond that, there weren’t many specifics, at least about Ortiz. 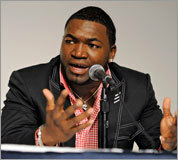 “David Ortiz does not know anything about his test result,’’ Weiner said. “Because he is the kind of guy that he is, he gave whatever possibilities might exist. David Ortiz doesn’t know whether anything he took had any effects on his 2003 result. That’s the unfairness of this situation is his reputation has been called into question. However, when reporters asked Ortiz yesterday what supplement he had taken, or if he had taken “androstenedione,’’ which was legal in 2003 but has since been banned, the slugger said he did not know. The test survey of players in 2003 was meant help baseball decide whether it needed mandatory random drug testing with penalties in 2004. Each test conducted in 2003 consisted of a pair of collections, the first taken on an unannounced date. Then, to attempt to eliminate the possibility that an over-the-counter supplement could trigger a positive, players were advised to cease taking any supplements before a second collection roughly a week later. Together, those two would combine to count as a single test. If the player tested positive on the first, then negative on the second, that was supposed to be considered negative. Certain players - chosen at random - were tested again, with another paired collection. Though 104 names are on the list, the MLBPA maintains that a maximum of 96 of those represent positive tests, not players, as some could have tested positive multiple times. But Weiner also said that only 83 of them are confirmed positives, with 13 tests in dispute by the Players Association. Because those 83 tests triggered additional testing, the Players Association did not explore the 13 tests it believed to be inconclusive. Weiner said they would have pursued a definitive answer had they thought the results would have individual consequences for the players. But since the names were never supposed to be released, they didn’t. Also, Weiner made sure to say that androstenedione - legal and not banned at the time by MLB - could have caused a positive test, though the paired testing was designed to prevent that. “It is unfair - in my view, unfair in the extreme - to draw any connection between whether a player’s name is on the list and whether either a) the player tested positive or b) a player took anything that was either banned or illegal,’’ said Weiner. The players’ union is in court fighting to get the records that include the list returned. Weiner said if the association wins, it is likely the union would agree to tell players what they were said to have used. Some past and present players have urged the release of the full list. Ortiz said he does not agree. “I don’t think I would really [like to] see another player go through what I’ve been through this week,’’ he said. tony massarotti For Ortiz, is it truth or consequences?